What is USB attached SCSI or UASP? We have all experienced a profound paradigm shift in how various forms of content is now being created, made digitally available, and shared. We are capturing more and more of our lives today in a digital form.The challenge is not only to create and capture this content, but to aggregate, analyze, store, and share this copious amounts of data, both locally and globally. As this trend continues and technology improves, the quantity of data and the size of it continue to grow exponentially, the data needs to be stored and backed up. And so we all back up our data, right? USB technology has improved a lot in the past 10 years, making it possible to transfer and backup bulk amounts of files faster than ever before. USB 3.0 currently supports speeds of up to 5.0 Gbps of bi-directional bandwidth. Next, in this natural progression is the USB 3.1 with a whopping 10Gpbs bandwidth. The mainstay of mass storage for both USB 1.1 and USB 2.0 has been the Bulk-Only Transport (BOT) standard. This served the computing industry well with its modesty in affordability, efficiency, and simplicity. However, for some, this speed is not enough due to the sheer volume of data that require backing up. Good examples are pictures, videos or if you are an enterprise/business user, server and computer image backups. This is where UASP can be of great assistance to you. UASP stands for USB Attached SCSI Protocol. It allows for faster read/write data speeds to and from storage devices. 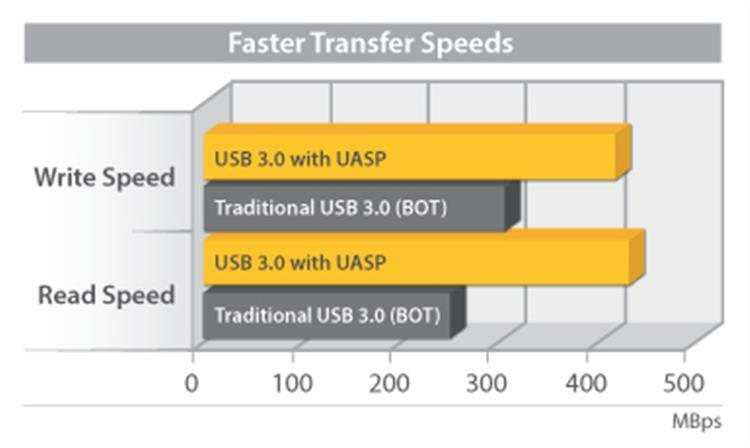 Compared to traditional USB 3.0 BOT, UASP performs up to 70% faster read speeds and 40% faster write speeds at peak performance. This is made possible due to the way UASP functions in comparison to USB BOT. UASP processes transfers in parallel, delivering data signals (Commands, Status, and Data In & Out) in dedicated “pipes”. BOT on the other hand, requires each signal to travel on the same “pipe”, taking turns, thus slowing the file transfer process. Another benefit to UASP is the reduction of required processor resources used by traditional USB when transferring data. At the same peak in testing, UASP shows an up to 80% savings in processor resources. How do I know if I have UASP? To take advantage of UASP-enabled devices you will need to be running Windows 8 or newer, or Mac OS X 10.8 or newer. Some versions of Linux running kernel 2.6.3 and higher can take advantage of UASP, but it is limited to a very small set of supported hardware. Most USB 3.0 hard drive enclosures and docking stations support UASP. All supported StarTech.com UASP hard drives docks and enclosures include UASP in the product title as well as the technical specifications section. And with the new USB 3.1 Gen 1 (5 Gbps) and USB 3.1 Gen 2 (10 Gbps) enclosures for 3.5” SATA drives, you will be able to get the speed and capacity you want in external data storage. Our single-drive enclosure for 3.5” SATA hard drives gives you Super-Speed Plus USB 3.1 Gen 2 (10 Gbps) performance with a large drive capacity of up to 6TB – twice the speed of Super-Speed USB 3.0 (USB 3.1 Gen 1) technology. It lets you leverage the high performance of the latest SSHDs and hard drives while alleviating bottlenecks in your data transfers. Having a supported Operating System and hard drive enclosure/dock are not the only requirements for taking advantage of UASP. Your USB controller on your computer also needs to support UASP. Like enclosures and docks, most controller cards, including StarTech.com ones, are UASP supported but be sure to check the specifications before purchasing a new card. Taking advantage of UASP will save you a lot of time when transferring large amounts data, enhance your PC’s performance and free you up sooner to get back to the daily grind. **We have been working hard to enable TRIM as a standard feature and offer firmware solutions for our newly released storage products but at this moment it is not fully supported with all products. We have a solution currently available for all of the enclosures listed below, and we are working to release a field upgradable version for our other USB 3.1 Gen 2 products. StarTech.com products that support TRIM. Do your UASP enclosures support translating the SCSI UNMAP command to TRIM? Otherwise SSDs in the enclosures won’t receive TRIM commands. Yes, all of our single bay enclosures support TRIM commands. If there is a particular product you are interested in knowing more about, we would be happy to look into it. Thanks! We looked into this further for you and discovered a some commands are not being passed on to the drive. If you like, we can arrange for firmware that will enable the functions you need. Let me know and I can email you directly to get you the proper firmware. Thanks! I’ve got the aforementioned adapter as well. Could you email me the firmware with UNMAP support? It would be best if you could also email me the original firmware without the support enabled, just in case the feature does not work well. Hi Tom, I’ll look into this as well for you! I have the same adapter USB312SAT3CB and also USB31CSAT3CB. And they also do not have TRIM support. Would it be possible to have a firmware upgrade for the adapters so I can have TRIM support. I use many SSDs with these adapters and they are slowing down as TRIM as it is isn’t working. Hi Manzur, I’ll look into this for you! I had an Acer R11 convertible notebook and I used this with four different UASP enclosures containing a Samsung SSD on the USB 3 ports. I had lots of problems with all four enclosures both under Windows 8 and 10 (hanging, corrupted filesystem ,ect.) and when booting directly from the USB drive via the BIOS. I had no problem on other systems. So the Acer R11 clearly has some ‘issues’ with USB 3. 1. Is it likely that the BIOS/firmware would use UASP when booting from the USB 3 enclosures? 2. If I connect the USB 3 enclosure to the USB 3 port on the laptop using a USB 2 extension cable – will it still use UASP or is that a USB 3 feature only? Hi Steve, Are you using StarTech.com products? If so, we would be able to provide more in-depth information but I have some answers to your questions below. 1. This is possible and could be confirmed with your motherboard manufacturer. 2. UAS and UASP were introduced as part of the USB 3.0 standard, but can also be used with devices complying with the slower USB 2.0 standard, assuming the cable supports it. Does this enclosure support TRIM or it will be soon with a firmware update? I have just brought the S251BMU313 but found that it doesn’t support trim. I see the posts that you have been working on the firmware update. What is the progress so far? Will it be available soon? I’m considering to return it before the returning window closes. Check in with our Technical Support team, they will have the most up-to-date status on the firmware: https://www.startech.com/Support. They can help you figure it out or help you return it if you need to. Our Support team is available via chat, email or phone (and are available 24×5, Sunday 9pm to Friday 9pm (ET)). I was on chat about this and they said this S251BMU313 was being worked on but no ETA. I’ll put in my vote for updating it to support Trim (I have a S251BMU313 and am trying to decide to hold until new firmware or return it) because of the Trim+SSD problem. Hi Susan, i was wondering if startech offers a usb3.1 to SATA adapter that is not fully vulcanized into rubber, but that can be opened. I’m asking this because i experience severe faults with usb3 to sata adapters due to the bridge chip insanely overheating. If you are looking for a product suggestion or have questions about our products, please get in touch with our Technical Support Team. They would more than happy to help you out! hi susan. Any update for trim support on s251bmu313? I emailed startech.com/support, but they couldn’t provide any update. I am curious though, as it has the same chipset as other external enclosures that you have enabled trim but not for this one which also happens to be one of the most expensive you have for 2.5 inch. I’m also disappointed by the omission of TRIM support for the aluminum version of the USB 3.1 enclosure (as listed in the FAQ linked below). So the choice seems to be either settling for plastic or buying an enclosure from another manufacturer. Observed Standards, you guys might be able to explain whats going on. What I have seen is that if you use a Sata drive in one dock, it can appear to not be formatted in another dock. For example i have 1 dock which supports firewire 800 and usb2 this is ideal for my mac’s as firewire800 is at least twice the speed of USB2. Now if i want to read that drive on another computer with USB3 and not firewire If i put the drive in a USB3 compatible dock then the drive format isn’t recognised. Ok if it is returned to the first dock. So it seems there is a difference in the way that the 2 docks communicate with a SATA drive. Is it just a protocol issue or is it worse than that. If it is a matter of protocol how do i figure out which protocol is being used by which dock. Naturally I would prefer to find a USB Dock that is compatible with drives that have been formatted in the Firewire Dock. This blog post is high in google results for people interested in whether StarTech enclosures support ATA TRIM to SCSI UNMAP translation, and I suggest you take advantage of it. Right now, most external USB 3.0 enclosures with UASP support still don’t do ATA TRIM to SCSI UNMAP translation, so you have an opportunity to stand out in the market. Just having this page being so visible is a nice start, but the main question still isn’t answered here after all of this time. Rather than individually redirect people offline to your tech support team (where who knows what happens and if anything gets resolved), why not openly help everyone else who finds this page by simply publishing a list of your current USB enclosures with UASP support that do ATA TRIM to SCSI UNMAP translation? This is an important stand-out feature, and finding solid information is still annoyingly difficult at the moment. I believe that what Robert was talking about is something more specific than just having trim work under windows, which as far as I can tell (from searching google) uses ata passthrough to issue trim commands. What Robert would like, and I would also be interested in is having the controller map SCSI UNMAP to ATA TRIM, which would in theory allow current linux versions to issue trim commands to an ssd inside the enclosure. I own a S251BPU313 enclosure, trim does work under windows but fails on linux. I agree with Robert that if trim worked well both on windows and linux it would be a differentiating feature and might be the deciding factor of buying one of your enclosures. What about that very popular (& often on promo) SATA to USB adaptor with cable I use to clone/backup drives with, usually around $10 to $13? As long as I’m using WinPE media (Windows 8.1 or 10) created by Macrium Reflect, shouldn’t the USAP function still work, even if using to image an XP/7 partition or drive, since it’s running outside of the Windows environment? I have two of these & performs backups faster than my USB 3.0 docking station, as well as my eSATA to USB cable, the latter of which is used mainly for the secure erasing of SSD’s. Our Technical Support will be able to explain the technicalities and if the UASP would still work in your setup. They are available via chat, phone or email. TRIM is important, what about power save features? Will USB attached storage allow DIPM (SATA Device Initiated Power Management), HIPM (HOST Initiated Power Management) and LPM (SATA Link Power Management)? I’ve Googled this to no avail: how do I disconnect an external USB hard drive (either UASP or not)? Do I simply “hot unplug it” so to say, when the drive still possibly spins? there is no eject button for USB hard drives such as for USB flash drives. It’s confusing and does not feel right. Thanks! Is there such a thing as an mSATA enclosure with UASP? One “answer” I saw made it seem like these were like oil and water (that is, not to be blended together) but other (M.2, 2.5″ SSD) enclosures both should and do have UASP. Hello, is there any update on TRIM support for the S251BMU313 USB 3.1 enclosure? I ended up on this page while searching and I read that you were working on something for that. We have updated this device to support TRIM. Please head over to StarTech.com/Support to get in touch with one of our advisors (phone or live chat) and they will assist with replacing your enclosure with an updated TRIM ready version. Do you have a list, where we can look which products will support all those needed commands (TRIM and others)? Hi Anom! Unfortunately we don’t have one central place to find this information. For our “Drive Adapters and Drive Converters” category, you will need to check each product’s technical specifications individually. If you have any questions about a specific product, please reach out to our 24 hour Technical Advisor team. which reported that trim was not working. Am I missing something. Please advise! While TRIM support is listed on our tech specs for our USB312SAT3CB adapter cable, it also needs to be enabled on the SSD that you’re using. Our team will need to know the makes & models of your drives to confirm if TRIM support is enabled. They’ll be able to help you troubleshoot via live chat (www.startech.com/chat) or phone: 1-800-265-1844.